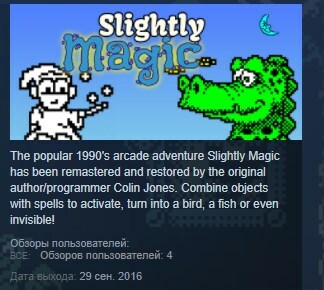 Remastered and reprogrammed, here´s the legacy edition of the popular 1990´s game Slightly Magic. Expanding on the arcade adventure style, Slightly Magic was noted for using spells to solve puzzles. Each spell has an ingredient which needs to be combined with the spell to activate it. Run, jump and dodge, collect items and spells, change your form and generally have a fun time in Slightly´s world. Bigwiz the wizard has left the castle in a hurry, in order to turn the King’s son Newton back into a frog. Indeed, he was in such a hurry that he forgot to pack his spare wand, forgot to lock his laboratory door, and most importantly, forgot to return his utterly stupid, idiotic, incompetent, brain-dead nephew Slightly to his parents’ mud hut in the hills. Oh well, it could be worse. A sunburnt dragon could be running off with the beautiful Princess Croak as we speak. The wizard’s spell cabinet might have been knocked over by a Flaming Octarian Whirlwind, scattering the spells everywhere. His kingliness the King might, in a fit of blind panic, have given Slightly the wizard’s private spell book to read. It might rain. You see, it could be worse. But as it is, there’s not a cloud in the sky, a breeze in the air, or a whiff of dragon’s breath to be sniffed. Hang on, where’s that pink fire-breathing creature going with that screaming princess? Is that a gentle wind wafting in through the door, or is it something stronger?